Does Anyone else love Red Robin’s Bonsai Burger or the Teriyaki Chicken Burger? I do. In fact, my husband makes his version at home for my birthday, and I was born on Christmas Eve. That means he gets himself out, in the snow typically, and grills for me: true love. He even makes the teriyaki sauce from scratch. I prefer the teriyaki chicken burger to ground beef, much to his chagrin. My husband usually uses marinated chicken breasts, but I decided to take a turn making these and used ground chicken to make the chicken burger; a compromise for a house in love with both chicken and burgers. I like to drizzle extra teriyaki sauce on the toasted bun and pineapple. This is a pretty healthy burger compared to its ground beef counterpart. Let me know what you put on it. You might also like these recipes. The ground chicken is basted with teriyaki sauce, grilled, and topped with cheddar cheese, tomato, shredded lettuce, and sliced pineapple. Preheat the grill to 350 degrees. In a large bowl combine the ground chicken, garlic powder, onion powder, ginger, black pepper, and salt. Mix until the seasoning is fully incorporated into the chicken. 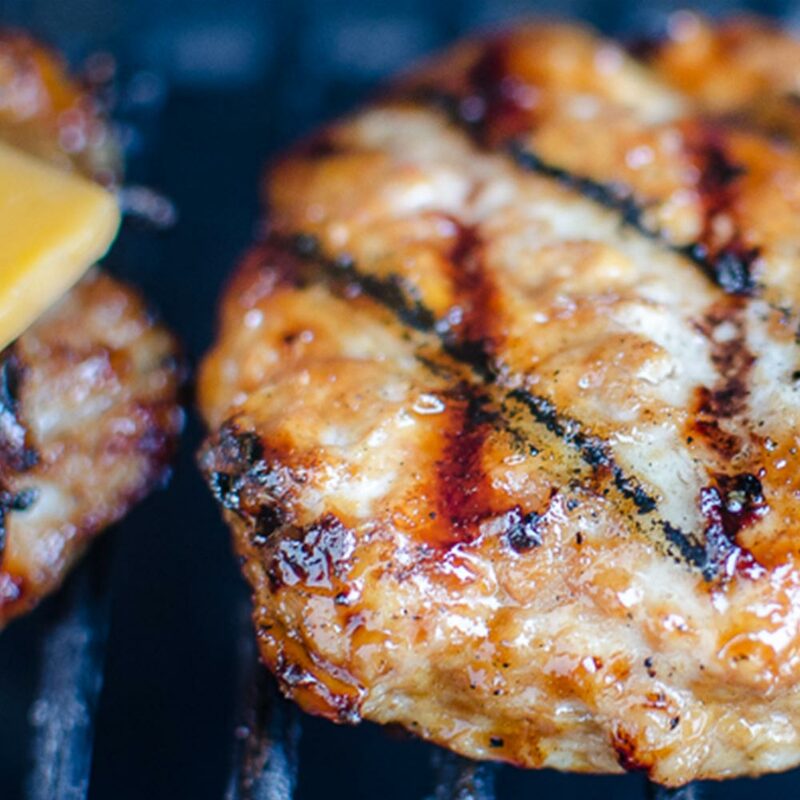 Divide the chicken into six equally sized mounds and pat into a round, burger shape. Place the burgers onto a baking sheet and place in the freezer for 15 minutes to provide more ease in handling. Place each patty on the grill and cook each side for at least 2 minutes before brushing with the teriyaki basting sauce. Continue cooking the chicken burgers turning every 5 minutes and reapplying the teriyaki sauce until fully cooked. Move burgers to indirect heat and place the cheese on top. Remove chicken when cheese is melted. Place chicken burgers on a bun and top with shredded lettuce, tomato, and pineapple.